President Trump shows the executive veto of the national emergency resolution in the Oval Office of the White House Friday. "Today I am vetoing this resolution," Trump said, flanked by law enforcement officials at an Oval Office event. "Congress has the freedom to pass this resolution and I have the duty to veto it." 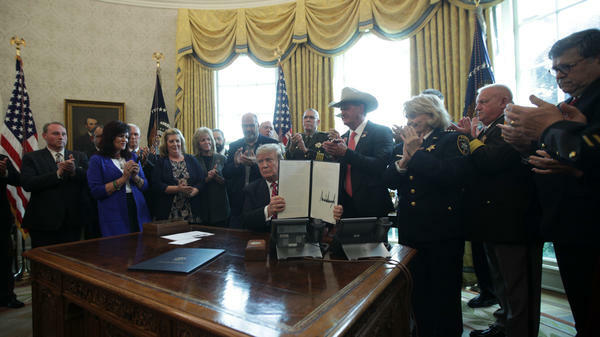 Also in the room for the veto signing Friday were parents of children who were killed by immigrants who entered the country illegally, as well as Vice President Mike Pence, DHS Secretary Kirstjen Nielsen and Attorney General William Barr. "I don't know that I've ever been more proud than to be standing next to you today," Pence said. "You're keeping your word by vetoing this legislation." Indeed, Trump had telegraphed his plan to proceed with additional wall spending on Thursday, minutes after the Senate voted 59-41 to block it. Twelve Republican senators joined Democrats in rejecting the president's emergency declaration. "I look forward to VETOING the just passed Democrat inspired Resolution which would OPEN BORDERS while increasing Crime, Drugs, and Trafficking in our Country," Trump tweeted. "I thank all of the Strong Republicans who voted to support Border Security and our desperately needed WALL!" And Friday afternoon Trump again thanked those GOP senators who had voted to allow his emergency declaration to go forward. "This will help stop Crime, Human Trafficking, and Drugs entering our Country," the president tweeted. "Watch, when you get back to your State, they will LOVE you more than ever before!" Trump declared a national emergency last month, after Congress authorized only $1.3 billion in border wall funding, far short of the $5.7 billion Trump had asked for. The emergency declaration allows the president to redirect funds from other accounts such as military construction to the Southern border wall. Republican senators who bucked the president said they did so to preserve congressional control over the government's purse strings. "We had a war against a king in the American revolution," said Sen. Lamar Alexander, R-Tenn. "This would be the first time that a president has ever asked for a certain amount of money from Congress, Congress has refused to provide it, and then the president has declared a national emergency under the 1976 act and said, 'I'm going to spend the money anyway.'" Alexander added that he shares the president's goal of border security, but warned allowing Trump to redirect money without authorization could set a dangerous precedent. House Speaker Nancy Pelosi, D-Calif., announced soon after the veto that the House would attempt to override it, after returning from a recess later this month. Republicans, Pelosi said, "will have to choose between their partisan hypocrisy and their sacred oath to support and defend the Constitution." Recent months have seen a surge in unauthorized crossings of the U.S. border with Mexico. Last month, roughly 76,000 people tried, including 43,000 children and family members, many fleeing violence and poverty in Central America. "People hate the word invasion, but that's what it is," Trump said Friday. The large numbers have put a strain on immigration enforcement, although critics say a wall would do little to discourage the crossings since many of those apprehended at the border turn themselves in voluntarily. 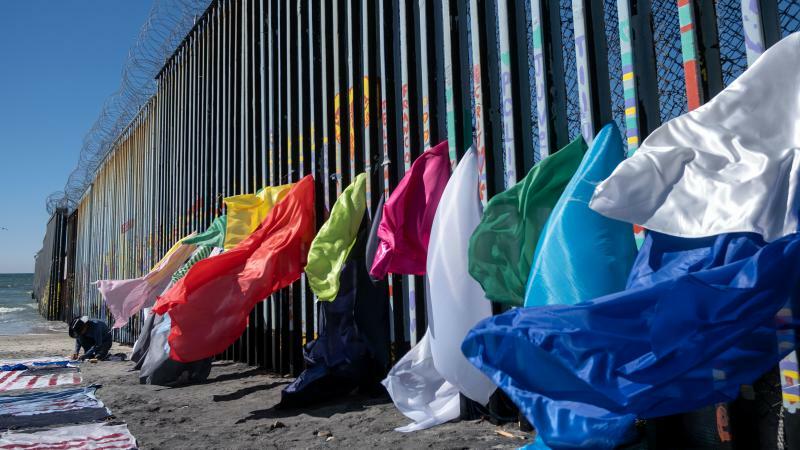 The border wall project still faces a variety of legal challenges, and despite Trump's veto, House and Senate votes against the emergency declaration could carry some weight in the courts. Trump insists he's on solid legal ground, however. "I think actually a national emergency was designed for a specific purpose like this, so we have a great case," Trump said. "Ideally, they shouldn't even sue in this case, if you want to know the truth. They shouldn't even be suing, but they will because they always do." On Friday, Barr also said the president's emergency order was "clearly authorized under the law." A showdown over border security and the limits of presidential power came to a head at the White House this afternoon. 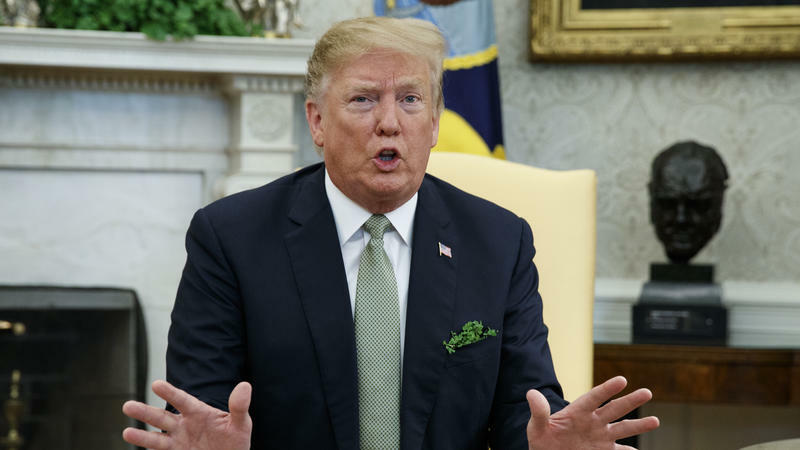 President Trump used his veto power for the first time, challenging congressional Democrats and some members of his own party. He vetoed a congressional resolution that would have limited spending on his controversial border wall. PRESIDENT DONALD TRUMP: Congress has the freedom to pass this resolution, and I have the duty to veto it. SHAPIRO: This comes after 12 Republican senators joined Democrats in an effort to regain control of the government's purse strings. NPR's Scott Horsley joins us from the White House. Hi, Scott. SCOTT HORSLEY, BYLINE: Hi, Ari. SHAPIRO: What does this veto mean for the border wall? HORSLEY: Well, it means the wall can go forward with a price tag billions of dollars higher than Congress had authorized. Remember, the president wanted $5.7 billion for the wall. Congress would only give him $1.3 billion. This was why we had a government shutdown for 35 days. It's why the president declared an emergency last month. Both the House and Senate voted to block that emergency declaration. And that's the move that the president vetoed today. Trump insists the country needs a more expensive and expansive border wall to deal with a surge of illegal border crossings. TRUMP: We're on track for 1 million illegal aliens to rush our borders. People hate the word invasion, but that's what it is. It's an invasion of drugs and criminals and people. SHAPIRO: Fact check that for us, Scott. Are we seeing a big spike in border crossings? HORSLEY: Well, we have seen a big increase in recent months. Last month, more than 76,000 people tried to cross the border. That's the highest in more than a decade. Many of those were women and - women and children coming from Central America. And that does put a strain on immigration enforcement. We should add though, Ari, Trump's former chief of staff, John Kelly, who was also Homeland Security secretary for a time, told NPR that for the most part, those Central American migrants are not criminals. They are not dangerous. And what's more, many of them voluntarily surrender to Border Patrol agents when they do cross the border. So it's not clear a wall is really the best way to address those increased numbers. SHAPIRO: This veto is not the end of the fight over the border wall. What happens next? HORSLEY: The president's Congressional critics don't appear to have the votes to override the president's veto. But the emergency declaration does still face a variety of legal challenges. Trump insists it will pass constitutional muster. But even some Republican lawmakers are not so sure about that. Tennessee Senator Lamar Alexander is one of a dozen Republican senators who voted to block the additional wall spending. LAMAR ALEXANDER: This would be the first time that a president has ever asked for a certain amount of money from Congress. Congress has refused to provide it. And then the president has declared a national emergency under the 1976 Act and said I'm going to spend the money anyway. HORSLEY: Now, the president said today he didn't lean on the Republicans who feel the way that Senator Alexander did. But he stressed that most Republicans in the Senate did vote to uphold his emergency declaration. SHAPIRO: Scott, on another subject, the president talked about the deadly mosque shootings in New Zealand. What did he have to say there? HORSLEY: The president spoke by phone earlier today with the prime minister of New Zealand and told her the U.S. stands in solidarity with her country as it copes with what he called a horrific event. The president, who spends a good deal of time talking about crimes carried out by immigrants, was also asked if he thinks white nationalism is a growing threat. And Trump said he doesn't think so. According to the Anti-Defamation League, all 50 of the extremist killings in this country last year were carried out by extremists on the right. SHAPIRO: Scott, before I let you go, I need to mention that today is your last day covering the White House after 10 years on the beat. Four of those years I shared the beat with you. Before you go cover economics for us, what are you going to miss about covering the White House? HORSLEY: Well, Ari, as you know, it is like riding a roller coaster for 10 straight years. But it has been a rare privilege to have had a window seat on two presidents now as they made history. And even on the toughest days, when you walk outside and you look up at that beautiful white building and think about everything it stands for - for people in this country and around the world - it's been a rare treat. And I wouldn't trade that for anything. SHAPIRO: Thank you for your great work over the years. NPR's Scott Horsley joining us from the White House. HORSLEY: Thank you. Transcript provided by NPR, Copyright NPR. Senator Rand Paul of Kentucky says he'll vote in favor of a resolution to terminate President Trump's national emergency declaration with regards to the U.S.-Mexico border. 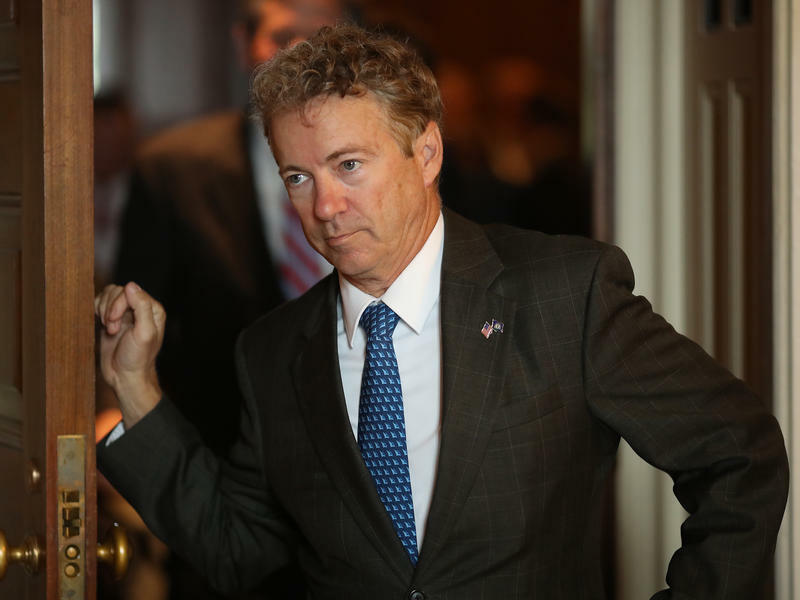 Paul's support means the resolution will likely pass the Senate with bipartisan support and could force the president to issue his first veto. Paul's announcement, coming from an-otherwise close ally of the president, lays bare the discomfort many Republicans have had with the emergency declaration. 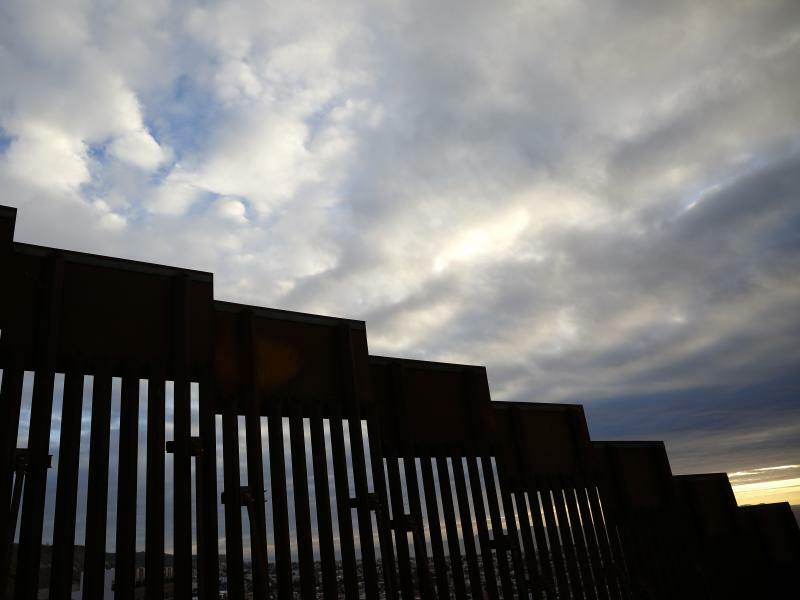 A group of 16 states has filed a lawsuit in a Northern California federal court against President Trump's declaration of a national emergency, calling the president's decision to use executive power to fund a border wall unconstitutional.